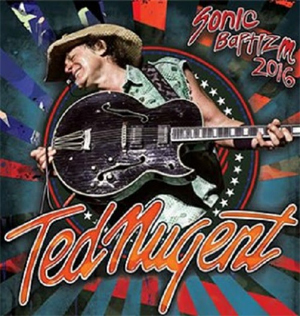 Ted Nugent is embarking on the Sonic Baptizm tour this summer and it’s bound to be wild. The first batch of shows has been announced with more still to come. Tickets and exclusive TedNugent.com Dangerzone VIP Packages are on sale now. Along with a ticket to the rock show of the summer, the Dangerzone VIP Packages include a pre-show meet and greet with Ted, a photo of the Nuge for autographing, a VIP laminate and more. Also, coming this spring, three of Ted Nugent’s classic albums are set to return on limited edition green vinyl. Limited to 2,000 copies worldwide, the paralyzing State Of Shock (coming in April), Ted's debut album, Ted Nugent (coming in May), and the 1976 platinum-selling Free For All (coming in June) are available to pre-order now. These deluxe reissues feature the original album art cover, an inner paper sleeve and are pressed on translucent forest green vinyl. No doubt about it, they're the perfect addition for any Nuge fanatic.